Flogging a festival is hard work, ask anyone daft enough to think they can get away with it. There is a collection of calamities for every Castlepalooza, a box of bankruptcies for every Belsonic and many a chain smoking, sweary booker languishing in a post summer lull promising to never, ever, do it again. Let’s face it, there is no shortage of the things as any regular reader probably knows. Given all that, flogging a festival that sits on the Atlantic Coast in Mid-November might be seen as a fools game. Clearly, the folk on the North coast don’t care. Atlantic Sessions is rolling into its 9th year with a 2017 NI Tourism Award tucked under its arm for warmth. It might be a little cynical to suggest that this festival, which oddly coincides with the food festival, led by Causeway Coast and Glens Council, is little more than a ploy to tempt people northward, but that would be unfair given the quality of the lineup and the amazing venues included. Yes, this is designed to bring life to the coast midwinter but the same could be said for a festival that takes place at the other end of the country, could it not? Come November over 60 acts will perform in coffee shops, hotels, restaurants, arts venues and bars across four days, the vast majority of these shows are free to attend. The only tickets you need are for headline events, so as festivals go, this one is a bargain. Tie in a couple of dozen fine eating establishments, some glorious open fires, a bellyfull of great stout and free shows and I for one welcome our new overlords. This years line up sees PORTS play at The Anchor in Portstewart (Thursday 16th November) accompanied by Prima Quartet, bringing lush strings to their already big sound. PORTS are supported by ROE and Sam Wickens. Thursday sees the music trail and a couple of shows yet to be announced, expect surprises and a rush for tickets. Joshua Burnside, Rory Nellis and Gareth Dunlop headline the Friday night showcase (17th, Atlantic Bar Portrush) with full bands. The show is followed by ‘Snake Eyes’, a night of whiskey-soaked music from DJ Joe Lindsay, promising a night that will be difficult to forget. Fridays Music Trail includes Eilidh Patterson and VerseChorusVerse and a host of others. 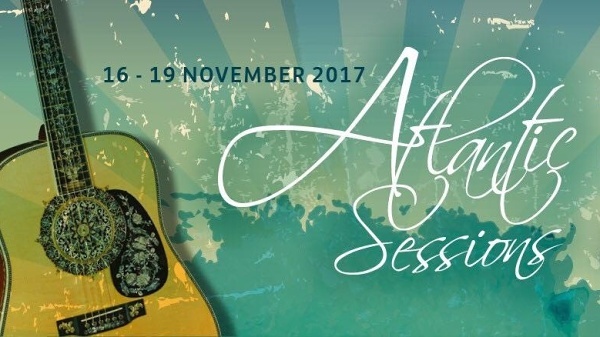 Your head will not thank you for Friday’s overindulgence and Atlantic Sessions will positively punish you for it with a whopping 15 shows lined up for Saturday (18th November). At the time of writing Ryan Vail is SOLD OUT but the rest are up for grabs and start at 11am, you’ll need to get up early and down some strong coffee you filthy beast. Acts include Gerry Norman, Junior Johnston, The Emerald Armada, The Holy Innocents, Brand New Friend, Ivor Novello Winner Iain Archer, and that sold out Ryan Vail Laser A/V show which will light up the Arcadia both inside and out with custom LED lighting and 3D Video Mapping. If you don’t have tickets, grab a coat and watch the show from outside! Saturday ends with a DJ set from Radio One’s Phil Taggart back at the Atlantic bar, bringing you back to the scene of the crime from Friday. It will be nothing less than you deserve. Atlantic Sessions has traditionally welcomed the BBC’s Ralph McLean to curate the Sunday lunchtime shindig and he has delivered beautiful sessions every time. This year (19th November) is no different, the show will feature Malojian, Mandy Bingham and Paddy Nash and speaks for itself. One of our favorite writers, Glenn Patterson, will co-host an event with the amazing Neil Martin to make their north coast debut. Last year they co-created the highly-acclaimed Long Story Short: The Belfast Opera. For this performance, they draw on their extensive repertoires – words and music on humour and love and loss and dismay and hope and wonderment. This will be a joy. With a dozen more acts to be announced, some awe-inspiring shows to list and some tweaks to finalise, 2017 is looking like a winner. We have it on good authority that there are a couple of surprises in store so it might be worth following this lot and making sure there is some petrol in the motor. In addition to headline events, Atlantic Sessions sees a host of FREE GIGS that run across the four days. Acts include Amanda St John, Amy Montgomery, Anthony Toner, Bowana, Brigid O’Neill, Cup O Joe, Emer Maguire, Edele McMahon, Larks, Lauren Bird, Michael Mormecha, Matt McGinn, Roe, Runabay, Simon Murphy, Stephen McCartney, Teddy Charles Jnr, Toni Whitten, Tom McShane, Wanderers, and the Wood Burning Savages.